On the savannas of Kenya, Africa, there grows a tree that is exclusively inhabited by four species of stinging ants, some of which live nowhere else; Crematogaster nigriceps, Crematogaster mimosae, Crematogaster sjostedti, and Tetraponera penzigi. At the slightest movement of a branch these ants will swarm out and deliver painful stings to grazing giraffes and other browsers. Of the four species Crematogaster nigriceps, or the nigriceps ant, is the least war-like. The tree of choice for the nigriceps ant and its competitors is the whistling thorn acacia (Acacia drepanolobium). Besides having regular thorns, the whistling thorn acacia also has modified thorn pairs which are joined at the base by a hollow, bulbous swelling up to 3cm in diameter. These thorns provide excellent nest sites for the ants. The ants have adapted to living in trees because the soil, known as "black cotton", gets waterlogged and spongy during the rainy season, and dries out and cracks during the dry season. This makes it difficult for ants to build nest underground. The acacia's have special glands called "nectaries" at the tips of their leaves that produce a sweet secretion just to feed the ants. Savage competition for the whistling thorn exists between the four species of ants. When branches of the trees meet the ants will invade their neighbor and battle violently for control of the tree, until one colony wins. The nigriceps ant comes out very badly in these battles, losing more than any of the other three species. To defend their trees against invasion, nigriceps ant colonies actively prune their trees. They chew off all axillary shoots (horizontal shoots), causing the tree to grow tall and skinny. In this way the ants avoid contact with other trees which may hold enemy colonies. Pruning also causes the tree to allocate more energy to new shoots, healthier leaves and larger nectaries, which is also good for the nigriceps ants. The relationship isn't as symbiotic as was first thought and turns out to be more of a parasitic relationship. Unfortunately the ants also prune off all flower buds so the tree can't bear fruit and reproduce, and is therefore sterile. Scientists hypothesize that the whistling thorn acacia has made a trade-off between reproduction and increased vigor plus protection from browsing animals. Whistling thorn acacias bearing colonies of less destructive ants are still able to produce seeds and continue the species. Like all ants, the nigriceps' body is divided into three main parts; the head, thorax and abdomen. They also have an exoskeleton, meaning that the skeleton is on the outside and isn't covered by skin, muscles, or tissue. 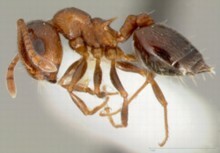 Crematogaster nigriceps has a black head and thorax and a red abdomen. The head of an ant consists of its eyes, antennae and jaws. Ants have compound eyes with many small eyes, called ommatadia, connected together. The two jointed antennae allow the ant to pick up the scent of different chemicals, or pheromones that ants use to communicate. Three pairs of legs are attached to the thorax. Each leg has five main joints. The abdomen is made up of telescopic segments which allows it to be extended or contracted. It also contains the poison sac and the stinger. The nervous system of an ant consists of a long nerve chord that runs from its head to the end of its abdomen. The heart is also a long tube that pumps a clear liquid back and forth through the ant. The liquid coats the inside of the ant and then is sucked back into the tube again. Ants don't have lungs, instead taking in oxygen through small holes all over their body and letting off carbon dioxide through the same holes. Ants also have two stomachs. One stomach is called the social stomach and is used to carry food back to the nest to feed the larvae. Once the food is mixed with gastric juices of the second stomach it can't be regurgitated. Ants are social insects and live in large colonies like bees. There are three types of ants in a colony; a queen, sterile female workers, and males whose only duty is to mate with future queens. The queen matures, mates and then lays eggs for the rest of her life. Ants go through four stages of their development: egg, larva, pupa and adult.